"This recipe is a delicious way to celebrate summer and the beautiful bounty of delicious fresh veggies. I picked up this recipe from my beautiful grandmother, and every time I make it I think of her and all the wonderful times we had together." Preheat oven to 350 degrees F (175 degrees C). Grease a 2-quart baking dish. 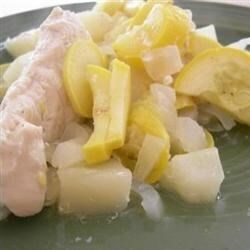 Place a layer of potatoes in the bottom of the prepared baking dish, followed by a layer of onion, a chicken breast, and a layer of squash. Repeat layers, season with salt and pepper, and dot the casserole with the butter pieces. Cover the dish with foil or a lid, and bake in the preheated oven for 45 to 50 minutes, until the casserole is bubbling, the vegetables are tender, and the chicken is no longer pink inside. Uncover the dish and bake for another 10 to 15 minutes, until the vegetables are starting to brown. Let cool 5 minutes before serving. This can also be cooked on the grill by layering vegetables and one piece of chicken on large piece of foil. Then season with salt and pepper, and top with small pat of butter. Wrap foil to form a pouch. It was okay. The flavor was pretty bland and it turned out really dry. I ended up having to add about 3 cups worth of chicken broth. It needs to be cooked a lot longer. It was also pretty bland. Disappointed.